A frightening, disturbing, trippy, and fun run-and-gun platform shooter that can perhaps best be described as Contra on a really bad acid trip; a hellish work of art replete with some of the strangest and most unsettling images you're ever likely to see in a game. The industrial rock/strange noise soundtrack and bizarre first-person plural writing only contribute to the highly surreal and LSD-like nature of this nightmarish trip. There is no background story, the protagonist simply needs to move on and destroy all threats. The creature can move around, jump, and shoot in any direction through mouse movement, using an unlimited amount of bullets. Next to the enemies there are also many platform elements, and short non-interactive scenes where certain messages or images are shown. To reach higher areas certain jump strips can be used to glide upwards. In later levels the character also needs to collect keys to open doors. 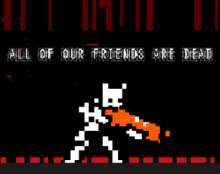 The game's dominant colours and black, white and red, and often disturbing images are shown. Every single hit is fatal and requires the level to be replayed, but it is possible to quick save/load a single gamestate. Some of the ideas were eventually re-used in the later-released Au Sable by the same developer.